Girlia's Cards: CHRIST-mas in July! Thanks for stopping in. This week at Celebrate the Occasion (CTO) we are highlighting CHRISTmas in July with no Red, CHRISTmas in July with no red oh my! So I used Hunter green and white. CTO is having a Design Team Call. Please stop over to view the details. Please stop and Celebrate with us by linking your project so that we may visit and leave you a comment. Enjoy and GOD bless. Comments are always welcome. Love your card. You did a wonderful job. Lovely card!! Love the white and black always looks elegant to me! Beautiful card! 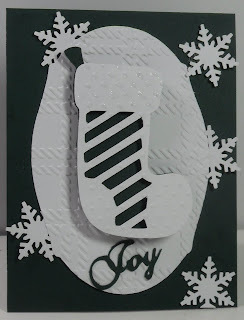 I love the embossing and snowflakes! Very cute card! I can't even think about cards this earlier; though I should be. Love, love the black and white!! Awesome job! Cute card, love the black and white! Thanks so much for sharing your DT talent at Celebrate The Occasion this week!! I like your embossing behind the stocking and the snowflakes! i LOVE THE EMBOSSING, YOU DID AN AWESOME JOB. Beautiful card girl. I just finished a xmas card also but it has red green purple and white in it. I did it for a contest. Wow! This card is awesome!! I really love the embossing and came out so elegant!